New Delhi, June 22: Hitting back with a befitting reply, Union Minister Ravi Shankar Prasad said that the comments coming out from the Congress leader Ghulam Nabi Azad is “embarrassing” and “irresponsible” and deeply regrettable. Stooping down to a demeaning level, Congress leader Ghulam Nabi Azad had alleged that anti-terror operations are killing more civilians than a terrorist. Addressing the press conference Union Minister Ravi Shankar Prasad said that the Congress leaders have utmost hatred from Prime Minister Narendra Modi and the BJP government. They have stooped to such an extent that they are seeking to compromise the courage and respect for the armed forces. In an interview given by the Congress leader Ghulam Nabi Azad that Indian Army has been killing more civilians than terrorists. The observation done by the Congress leader is irresponsible, regrettable and disapproving. The senior BJP leader said it was shocking that such a statement came from a person who had been the Chief Minister of Jammu and Kashmir and witnessed the "brutal face of the terrorism in the state from Pakistan side". Such allegations and comments coming out from the leader are shameful and there the BJP slated before the statistics of gunning down the terrorists. "In J&K, 72 terrorists were killed in 2012, 67 in 2013. In June'14 we came to power. 110 were killed in 2014, 108 in 2015, 150 in 2016, 217 in 2017 and 75 have been killed till May 2018. 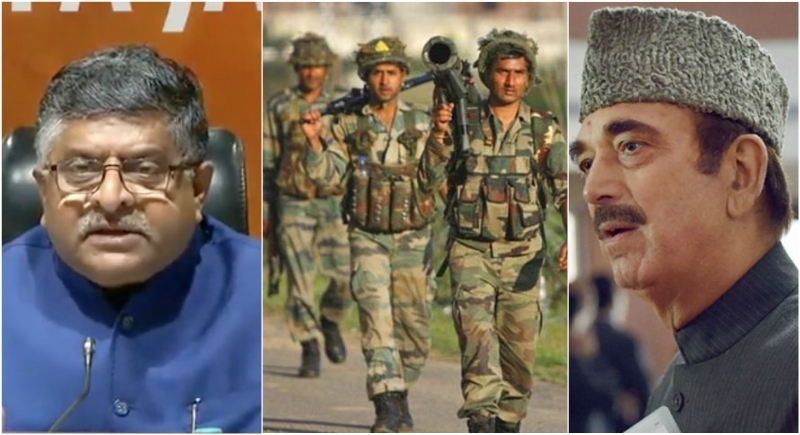 So Mr. Ghulam Nabi Azad you can see a difference between your and our government," Prasad said responding to Azad's statement in which he had reportedly raised questions over Army operations in the Valley. Ravi Shankar Prasad also said that the Congress led by Rahul Gandhi and "blessed" by Sonia Gandhi is at present making observations "in sync with the terrorists and their patrons". In an interview with a private television channel, Azad had said security forces were killing common people in Jammu and Kashmir in the name of eliminating terrorists. "They take action against four terrorists and kill 20 civilians along. Their action is more against civilians than terrorists. For instance, they killed 13 civilians in Pulwama and just one terrorist. Saying that it will be an all-out operation, clearly shows that they plan to do a massacre," Azad had reportedly said. He asserted that Lashkar-e-Taiba endorses sentiments of Congress saying added that statements of their party leaders break the morale of forces & impinge upon the security of the country. Hitting out at Congress leader Saifuddin Soz's statement on Jammu and Kashmir, Ravi Shankar Prasad said that Congress party echoes anti-India voices. He also lashed out at Congress party for terming Army Chief and Union Defence Minister's visit to martyr Aurangzeb's family as a drama.